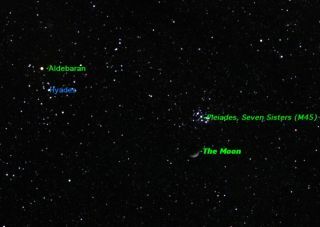 The crescent moon will appear close to the well-known Pleiades star cluster tonight (March 10) for skywatchers graced with clear skies. During its 29 1/2-day orbit around the Earth, the moon appears to pass close to many skywatching targets. The list includes all of the solar systems planets, several bright stars, and quite a few deep sky objects. Deep sky objects are objects other than stars beyond the solar system: clusters of stars, clouds of gas and dust, and distant galaxies. The Pleiades star cluster is a group of 800 stars, formed about a hundred million years ago and located 410 light-years away in the constellation Taurus. The Pleiades is one of the closest star clusters to the sun. Only the Hyades and the Coma Cluster are closer, at distances of 150 light-years and 300 light-years respectively. Since it is a very young cluster, the stars in the Pleiades are still very close together, which makes the Pleiades by far the brightest star cluster in the sky. The Hyades is actually brighter overall, but its stars are spread out over a larger area, so it doesn't seem anywhere near as bright as the Pleiades. This sky map of the cresent moon and Pleiades shows were to look to spot the cosmic sight. If you have a clear, dark sky tonight, look for the moon in the western sky, and then look just above the moon to spot the Pleiades. The Hyades cluster is a bit farther away to the left, close to the red giant star Aldebaran. How many stars can you see in the Pleiades? This star cluster has been known from ancient times, and one of its many names is the "Seven Sisters." Despite this name, most people can see only "six stars with their naked eye, though sharp-eyed observers may see more. The Japanese call this cluster "Subaru," and the logo of the Subaru automobile manufacturer depicts this star cluster. Many people mistake the Pleiades for the Little Dipper. While its six main stars form a tiny dipper shape, it is much smaller and located far from the northern location of the real Little Dipper, the constellation Ursa Minor. In Australia, the Pleiades is popularly called "the Shopping Cart"! In binoculars or a small telescope, the Pleiades is one of the most glorious sights in the whole sky. Hundreds more stars become visible, and, if the night is very dark, you may catch a glimpse of a faint wisp of nebulosity around the brighter stars. This is not a remnant of the gaseous nebula from which the Pleiades formed, but rather a nebula through which the cluster happens to be passing at present.